Honestly, who doesn’t love buttery hash brown potatoes? They’re absolutely scrumptious! If you’re a big fan of hash brown potatoes, then you’re going to love our recipe for broccoli potato egg pie. The recipe makes six to eight servings, and it features a blend of onions, egg, potatoes, cheddar, and butter. We suggest serving this for brunch or dinner, and you’ll find it hearty enough for either occasion. If you end up liking this dish, please go ahead and give it a rating and review! Ready to make some broccoli potato egg pie? Trust us, your family is going to love this recipe. You’ll need to assemble the following ingredients to get the ball rolling: Cabot Unsalted Butter, onion, hash brown potatoes, salt, breadstick dough, broccoli florets, Cabot Sharp Lite50 Cheddar, bacon, egg whites, eggs, milk, Cabot Light Sour Cream, paprika, and black pepper. Once all of the ingredients are assembled (you can check out the directions below), make sure to bake everything for 40 minutes at 350°F. Once the top of the pie turns golden brown, you’ll know that it’s all done. We hope you enjoyed our recipe! If you liked this one, then you should also try our recipe for cheesy broccoli casserole—that recipe is packed with tons of cheesy goodness! Speaking of cheese, Cabot is a cooperative of 800 farm families, and we love making dairy products. We’ve been making a wide array of dairy goods for generations, so it’s safe to say that we know a thing or two about cheese making. 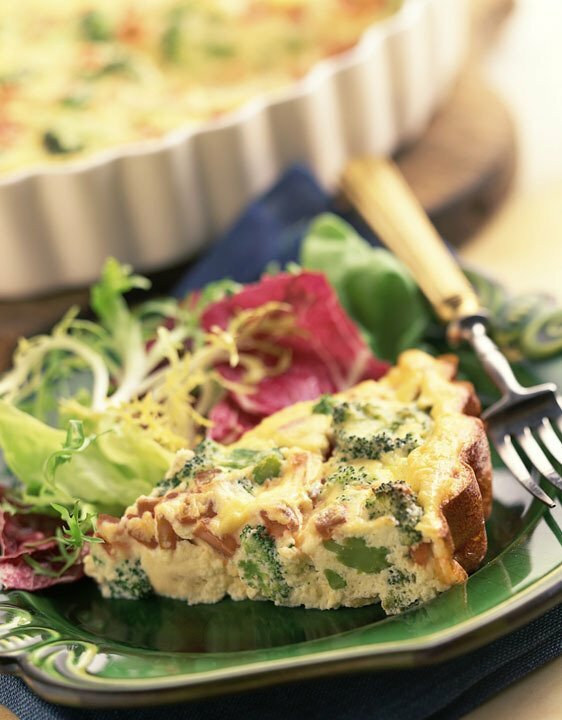 We’re positive that you’re going to love our recipe for broccoli potato egg pie, and we’d love to hear your thoughts about it. Did you like it or love it? Let us know! Rate and review the recipe after you’re done trying it. We can’t wait to hear from you. MELT butter, in large nonstick skillet over medium-high heat. Add onion and cook, stirring, for 5 minutes or until tender. Stir in potatoes and cook until lightly browned, about 5 minutes longer. Stir in ¼ teaspoon salt, remove from heat and set aside. PLACE large piece of plastic wrap on work surface. Unrollbread stick dough, separating into strips. Place one strip on plastic wrap and coil into spiral. ADD second strip, pinching ends together, and continue coil.Repeat with remaining strips to form one large spiral. Cover with additional piece of plastic wrap and let rest for 10 minutes. Without removing wrap, roll dough spiral out into 12-inchcircle. Lightly coat 10-inch deep-dish pie plate with cooking spray. Remove wrap and press dough over bottom and up sides of pie plate. DISTRIBUTE reserved potato mixture, broccoli, cheese and bacon evenly over dough. In medium bowl, whisk together whole eggs and egg whites until well combined; whisk in milk, sour cream, paprika, salt and pepper. POUR egg mixture evenly over potato mixture. Bake for 30 to 40 minutes, or until golden on top and set all the way to center.